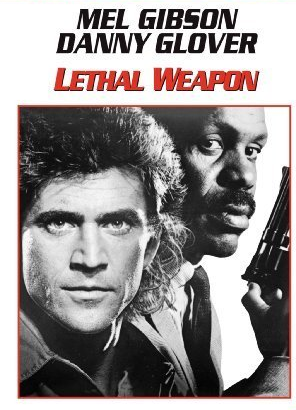 On the 7th day of Christmas Movies that have fun special fx, I picked Lethal Weapon (1987). From the beginning this movie is filled with Christmas cheer! Ita open with Christmas music and the characters say “Merry Christmas” throughout the whole film, since it takes place over the Christmas holiday season. The film ends on Christmas day, with holiday music playing joyously in the background. As far as makeup and special effects goes, there are plenty of squibs going off. Danny Glover gets shot in the arm and has some bruises. Mel Gibson gets the crap beat out of him and has some bruises, cuts and scrapes that don’t look as good to me now, as they did back in the day. Regardless, this movie is still a favorite of mine. The IMDB synopsis reads”A veteran cop, Murtough, is partnered with a young homicidal cop, Riggs. Both having one thing in common, hating working in pairs. Now they must learn to work with one and other to stop a gang of drug smugglers.” But I like to think of it as a story where Murtough helps Riggs learn the true meaning of Christmas and family togetherness.